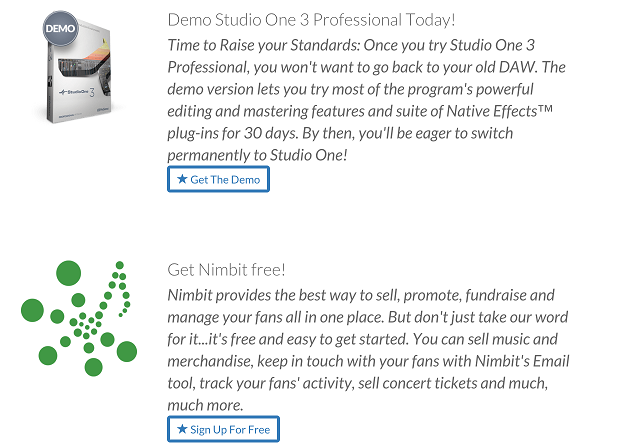 Yes we have a demo of Studio One 4. It is available through your registered My PreSonus account. First you'll need to create your account (Step 1) if you don't already have one. You must create a PreSonus Account in order to install and activate the software for use on your system(s). If you bought Studio One or from our website or purchased and registered a PreSonus Hardware product you already have a My.PreSonus user account. If you do not yet have a My.PreSonus user account, you'll want to create one. Beyond being a requirement to download and activate the latest version of Studio One 4, there are many benefits to creating a My.PreSonus account including easy access to additional documentation and other content files, access to the user forums, latest tips product videos and the ability to easily create a technical support ticket. To create a user account, go to http://my.presonus.com . On that web page, click , then fill out the provided form and then click again to create your new account. If your computer is not connected to the internet, you can still download and activate Studio One by using a different computer that does have internet access, as described in the Offline Activation section below. Once you create your account, a verification email from PreSonus is automatically sent to the email address you provided. Click on the link in the email to activate your account. Once verified go back and login to your http://my.presonus.com account. You are now ready to download and install Studio One Demo. Close to the bottom of the Start page for your My PreSonus Account, if you have not already activated the Demo, you will see a link to try Studio One Professional Demo free. Click "Get the Demo" to continue. The next screen will show you the details including the installer and content download links. Please follow the next tutorial and subsequent tutorials on how to install, activate and download content for Studio One.